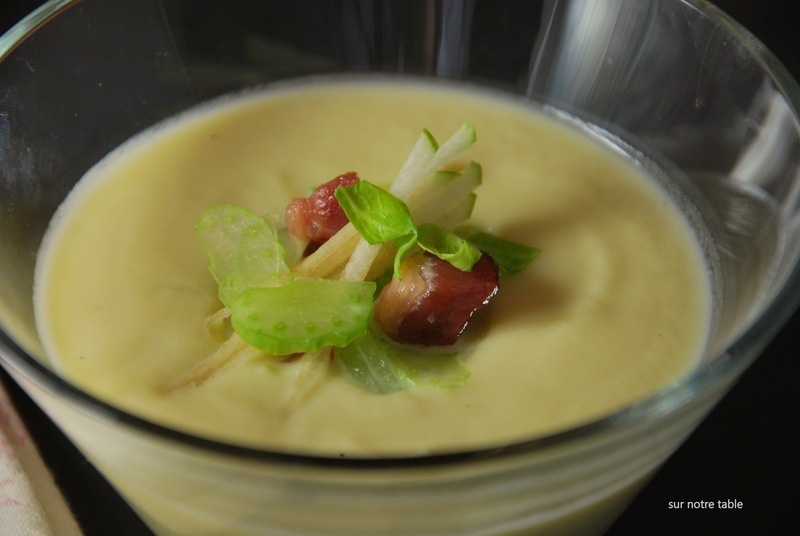 how bacon makes a celery root soup even better! Yes, more celery root, but this time it is for a soup! It is winter after all, and we’re looking to leverage what’s available seasonally. Celery root and leeks are great combination for a soup and this one is earthy and silky, however on it’s own it can be a little too subtle to the palate. 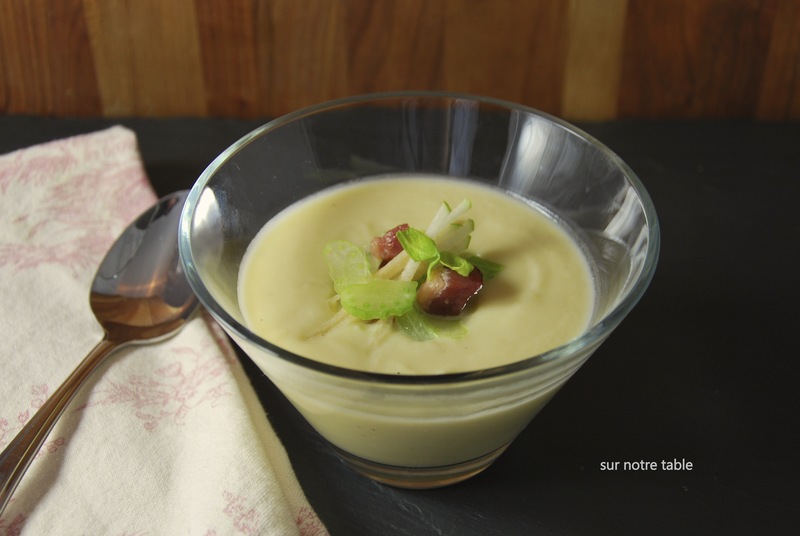 So we bring it to another level, by adding texture and extra flavours by garnishing the soup with finely chopped celery, celery leaves, green apple and the “piece de resistance”, the lardons (bacon pieces cut down to 1/4 inch cubes). This results in a sophisticated appetizer, which can easily be prepared in advance and served for your next dinner party. Add butter and olive oil to a large 4 quart pot over the stove. Add chopped leeks , celery root and onion and sweat in covered pot over simmering heat until leeks and onions are softened, for about 20 minutes. Do not brown leeks or onions, add more butter if they start to brown. Add water, chicken broth, 1 tsp of salt and ¼ tsp of black pepper and bring to a boil uncovered, then reduce heat and simmer, until celery root is very tender for another 20 minutes. Carefully pour soup into a blender and purée until smooth. Clean pot and return soup to pot. Bring soup pot back to stove and simmer on low heat. Add cream and heat until warm, stirring occasionally. You may add more water, about 1/4 cup, if you find the soup’s consistency to be too thick for your taste. Note that if you wish to serve the soup the following day, just cool soup and refrigerate without adding cream. When ready to serve simply add cream and reheat soup. While soup is heating through with cream, cook bacon into a large saucepan over medium heat, turning frequently until crispy for about 8 minutes. Transfer bacon to paper towels. Meanwhile thinly slice apples lengthwise into 1/8 inch thick slices working around core. Then cut each slice into small matchsticks. Thinly chop celery and celery leaves and set aside. When ready to serve divide soup into bowls and garnish soup with apple matchsticks, celery slices, celery leaves and lardons. As most of you know, one of the most important elements of great food is the quality of the ingredients. This is particularly relevant living in Montreal where seasonality plays a large part in what we bring to the table. For example, right now we can pretty much forget about having a watermelon salad for the next 5 months! Even though it’s available in our supermarkets, it sadly comes from far and away and this only results in a disappointing tasteless and colourless fruit. So for this reason we focus on seasonal ingredients when deciding on what to eat. 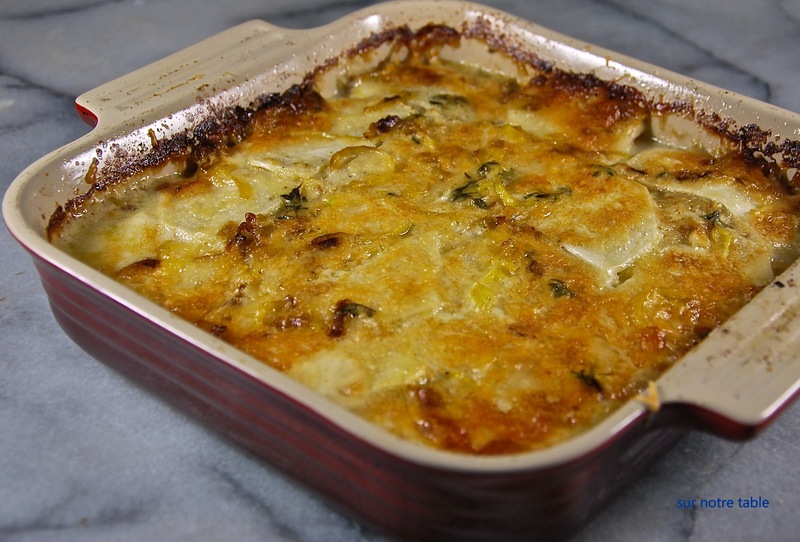 A potato, celery root and leek gratin is a perfect example of bringing seasonal ingredients together. Thankfully we’re not even thinking of having a watermelon salad anyways, as it’s the middle of winter and we’re usually looking for warm, comfort food! This gratin is the perfect fix for that and it is a great accompaniment to a roast beef or a slow cooked meat dish. This is an easy recipe as long as you have the patience to thinly slice the vegetables. Once that’s done you just assemble it all together in a gratin dish and let the oven do its magic. This side dish is not only foolproof but it also simplifies life when hosting a dinner as you can make it in advance, even the day before, if you wish. Once it’s cooked, you cool it completely and then refrigerate it until the next day and just reheat and serve. When you’ve prepared a three-course dinner for your guests having a gratin pre-made will save you time in the kitchen and allow you to focus on the other elements of your meal. Preheat oven to 350oF. Heat cream, garlic cloves and thyme sprigs in a small saucepan over medium-high heat until bubbles appear on the edge. Remove from heat. Melt 1 tablespoon of butter in a medium skillet over medium heat. Add leeks and season with Kosher salt. Cook leeks until tender (do not brown) for about 12 minutes, stirring often. Once cooked set aside. Once peeled, thinly cut the potatoes and celery root into slices about an 1/8 inch thick. A food processor is actually the best kitchen equipment for the job as it will not only slice them equally but will do so in just a few seconds. But no worries if a food processor is not part of your kitchen arsenal, you can do it by hand or by using a mandoline. 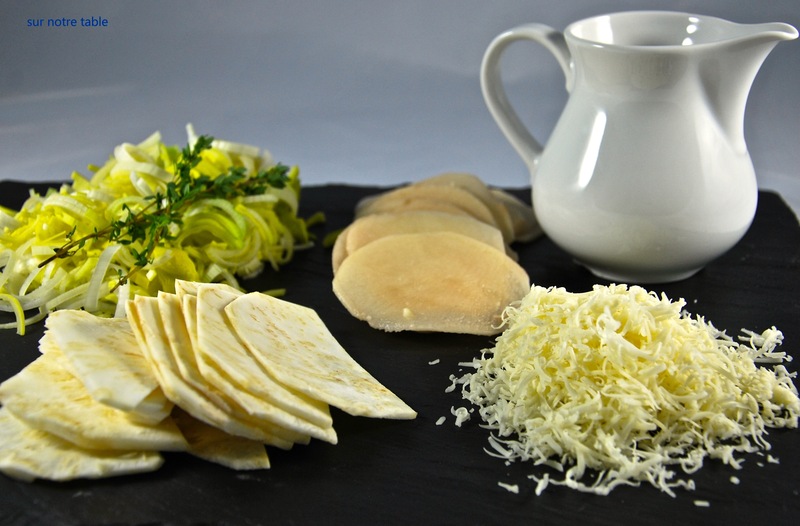 The celery root which is also referred to as celeriac has a very knobby exterior which must be peeled as well. The best method to peel the celery root is to slice off the exterior of the vegetable by using a knife instead of a peeler. Butter a square baking dish. To make the gratin all you have to do place three layers of all the different ingredients in the baking dish. Start with a layer of potato slices to cover the bottom of the baking dish, then add over top a layer of celery root slices. Then sprinkle this layer with salt and pepper and some of the thyme leaves. Repeat this process twice more. Then just add on top, the Gruyère cheese. Strain the cream into a bowl and then pour cream all over the top of the gratin dish. Tightly cover the baking dish with aluminum foil and place in stove and bake for 1 hour. Then remove foil and bake another 25 to 30 minutes until the top gratin is golden brown and sauce is bubbling. Let stand 15 minutes before serving! To reheat the following day, simply pre-heat the oven at 325oF and reheat gratin for 30 minutes. When reheating keep an eye on the gratin to ensure top layer is not browning too much if it is just cover dish with aluminum foil.